U.N. Secretary General Antonio Guterres attends the Intergovernmental Conference to Adopt the Global Compact for Safe, Orderly and Regular Migration in Marrakesh, Morocco, Dec. 10, 2018. The U.N. Secretary-General on Wednesday welcomed the formal adoption of the Global Compact for Safe, Orderly and Regular Migration at the General Assembly. "The compact is a non-legally binding agreement that reaffirms the foundational principles of our global community, including national sovereignty and universal human rights, while pointing the way toward humane and sensible action to benefit countries of origin, transit and destination as well as migrants themselves," Antonio Guterres said in a statement. The General Assembly voted 152 in favor, five against, with 12 abstentions to endorse the compact, which was the outcome of a conference in Marrakesh, Morocco, earlier this month. 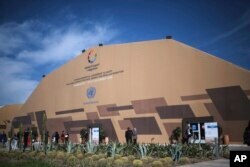 A view of the venue during the second and final day at the UN Migration Conference in Marrakech, Morocco, Dec.11, 2018. The compact is intended to be a framework for global cooperation. It is not a treaty and it does not impose any legal obligations on states, but it still incurred strong objections from a handful of countries. At Wednesday's vote, the U.S. Deputy Assistant Secretary for the Bureau of Population, Refugees and Migration, Andrew Veprek, expressed Washington's opposition. "While the United States honors the contributions of the many immigrants who helped build our nation, we cannot support a compact or process that imposes or has the potential to impose international guidelines, standards, expectations, or commitments that might constrain our ability to make decisions in the best interests of our nation," Veprek said. "The United States proclaims and reaffirms its belief that decisions about how to secure its borders, and who to admit for legal residency or citizenship, are among the most important sovereign decisions a state can make," he said. "They are not subject to negotiation or review in international instruments or fora." Hungary's Foreign Minister Peter Szijjarto speaks during a press conference in Vienna, Austria, Nov. 7, 2018. Hungary, which has taken a hardline position on migration under the government of Viktor Orban, staunchly opposed the compact. Foreign Minister Peter Szijjarto told the assembly the pact is "unbalanced, biased and extremely pro-migration" and that it would contribute to launching "new massive migratory flows all around the world." "This document suggests as if migration would be a fundamental human right, which is definitely not the case," Szijjarto said. "This document describes migration as if it would be the best thing that ever happened to humanity, but this is not true. Migration is a dangerous phenomenon." In addition to the United States and Hungary, also voting against were Israel, Poland and the Czech Republic. Other states welcomed the compact, though, saying it would help countries of origin, transit and destination to better manage migration, making it safer and more dignified. "My country, Ireland, knows migration," Ambassador Geraldine Byrne Nason told the gathering. "We have a long history of Irish people migrating all over the world. We believe this gives us a responsibility to play our part now." "We are now benefiting from the contribution of the 'new' Irish and those who have made Ireland their home," she added. Namibia's U.N. envoy, Neville Gertze, spoke on behalf of the African group of nations. "This landmark document constitutes a roadmap to prevent suffering of thousands of migrants. It will provide space to develop cooperation strategies that will benefit all," Gertze said. "Our global situation today and for the foreseeable future is one that will include migration, we cannot ignore this reality," said Canadian Ambassador Marc-Andre Blanchard. "We must find ways to harness the opportunities migration presents and to address the challenges. Today, we have an opportunity to begin working together."